Jennie Grossinger was born to poor but devout Jewish parents in a small town in Galicia (southeast Poland), then a part of the Austro-Hungarian empire. When she was a small child, her father emigrated to the USA to seek a better life for his family. Jennie, her mother, and younger sister joined him three years later, settling in a tenement on the Lower East Side of New York City. Jennie left school at age 13 to help support the family by working in a button factory. In 1912, she married her first cousin, Harry Grossinger, with whom she had two children. Jennie's father operated several short-lived small businesses, and by 1914 had decided to try farming. Jennie and her husband contributed to the purchase of a small rundown farm with no electricity in the Catskill Mountains region of New York State. Although the farm was unsuccessful, the family made money taking in summer guests from the city. Jennie worked as the waitress, chambermaid, and bookkeeper. Five years later, they were able to purchase a larger, more modern house with extensive grounds near the town of Liberty. Grossinger's Terrace Hill House expanded from a hotel into a major summer resort with tennis courts, golf course, a children's camp, and its own theater. At first, the facilities attracted mostly Jewish guests, drawn by the kosher food and the 400-seat dining room; but eventually Grossinger's grew into a year-round resort frequented by sports writers, ooliticians, Broadway stars, Hollywood celebrities, and business conventions. It also helped launch the careers of many entertainers. Jennie managed the resort with her husband, and in time her name became legendary. She was active in charity work, making gifts to local charities and needy families, and went on to became an important fundraiser for hospitals and other institutions in the USA and Israel. Her book, The Art of Jewish Cooking, is still in print. Jennie Grossinger is currently considered a "single author." If one or more works are by a distinct, homonymous authors, go ahead and split the author. 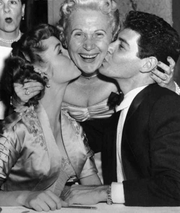 Jennie Grossinger is composed of 3 names. You can examine and separate out names.